For the past year, as part of Trump's escalating trade war against China, the Trump administration has been waging a parallel campaign to convince America's European "allies" (at least until the White House unleashes auto tariffs against Brussles in retaliation for China annexing Italy to the Belt and Road initiative) to bar China’s Huawei Technologies from their telecom networks, a process which so far has culminated with the arrest of the Chinese telecom giant's CFO in Canada. Bolstered by the success of similar efforts in Australia and New Zealand, the White House sent envoys to European capitals with warnings that Huawei’s gear would open a backdoor for Chinese spies. Last week, the U.S. even threatened to cut off intelligence sharing if Germany ignored its advice. So far, the gamble to pressure Europe has backfired: not a single European country has banned Huawei. Confirming that Europe and the US are now allies only on paper, was the scathing commentary by Angela Merkel at a Berlin conference on Tuesday: "There are two things I don’t believe in,” Merkel said: "First, to discuss these very sensitive security questions publicly, and second, to exclude a company simply because it’s from a certain country." And just like that, Europe took its place in the grand superpower race: right next to China (and Russia) against the US. As Bloomberg notes, Europe, and especially Germany, both of which are extremely reliant on continued open trade with, Beijing has been caught in the middle of the U.S.-China trade war. Trying to remain impartial, Europe has been seeking to balance concerns about growing Chinese influence with a desire to increase business with Trump's trade nemesis. And in a grand quid pro quo, with no ban in the works so far, Huawei is a budget frontrunner for contracts to build Europe's 5G phone networks, the ultra-fast wireless technology the continent's leaders hope will fuel the growth of a data-based economy, while building goodwill and hopefully receiving a few billion in Chinese investments in the process. The first salvo against Trump's diplomatic effort took place last month when the U.K.’s spy agency indicated that a ban on Huawei is unlikely, citing a lack of viable alternatives to upgrade British telecom networks. Next, Italy’s government also dismissed U.S. warnings as it seeks to boost trade with China. In Germany, authorities have proposed tighter security rules for data networks rather than outlawing Huawei. France is doing the same after initially flirting with the idea of restrictions on Huawei. Governments have also listened to domestic phone companies such as Vodafone, Deutsche Telekom, and Orange, all of whom have warned that sidelining Huawei would delay the implementation of 5G by years and add billions of euros in cost. Predictably, the US did not take the rebuke sitting down. In February, the White House dispatched representatives to MWC Barcelona, the industry’s top annual trade show, who urged executives and politicians to avoid Huawei and its Chinese peers. At the same time, the U.S. ambassador in Berlin wrote a letter to the German government saying it should drop Huawei or risk throttling U.S. intelligence sharing (Germany's response was not exactly calm, cool and collected). Then there is the matter of value, and here China beats everyone hands down. 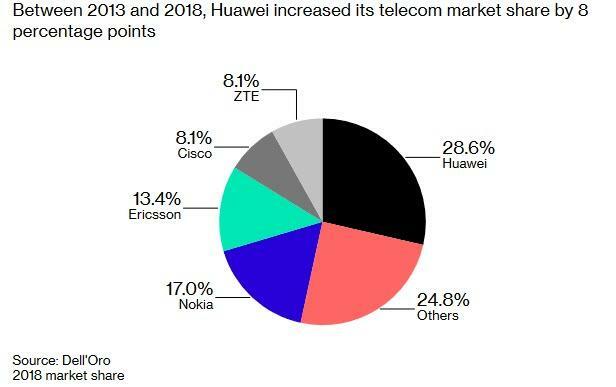 As Bloomberg notes, while "carriers can also buy equipment from the likes of Ericsson AB, Nokia Oyj, and Samsung Electronics Co., industry consultants say Huawei’s quality is high, and the company last year filed 5,405 global patents, more than double the filings by Ericsson and Nokia combined." Still, neither China, nor Huawei are safe yet. Since China has indeed been walking in the US' footsteps and has been using its own backdoors to spy on both foes and friends, German hard-liners in the intelligence community realize that the push-pull against Huawei is only there to score political points again Washington. They also admit the company isn’t trustworthy, and updated security rules the government is drafting will make it harder for Huawei to win contracts. Denmark’s biggest phone company, TDC A/S, declined to renew a contract with Huawei and instead picked Ericsson as strategic partner to develop its 5G network. Even as Europe refuses to block Huawei, the Chinese telecom giant has been under increasing pressure to allow greater scrutiny of its technology and increase assurances its equipment can’t be accessed by Chinese spies. In response, Huawei told Bloomberg it has “placed cyber security and user privacy protection at the very top of its priorities" adding that safeguarding networks is the joint responsibility of vendors, telecom companies, and regulators. But most importantly, despite US insistence, so far there’s little evidence to suggest Europe will shun Huawei. In fact, as Bloomberg adds, the national railway companies in Germany and Austria have bought the company’s equipment, and carriers such as Deutsche Telekom and Telefonica are running 5G test projects with its products. As a result of Europe's rebellion against the US, Huawei’s global revenue growth accelerated in the first two months of the year, climbing by more than a third, founder Ren Zhengfei said last week. And the company says sales of its smartphones doubled in Germany during the same period. Meanwhile, the question of how Trump takes defeat in diplomatic pressure with Europe remains open, not to mention how this would translate from mere diplomacy to global economics and capital markets: one thing is certain, should Europe's rebuke of Washington be overly publicized, tariffs on Europe's exports - such as automobiles - to the US would appear inevitable, as would the next global recession as globalization takes it next big step backward.